I’ve often thought what a blessing it is NOT to know what the future holds. Jeff and I have talked about this numerous times, remembering our innocent newlywed selves and thinking “thank goodness we did not know what lay ahead of us.” That’s not to say that we have not had full, happy lives. But some of what would transpire over the next 30 years would have seemed unthinkable to us in 1980. As Nazarian implies, the idea of being grateful for the uncertainty applies to moments as well as years. For those among us who have a hard time with unpredictable schedules and unplanned interruptions, this is a significant challenge. But I do think our days are less frustrating if we are able to absorb the minor ups and downs without having everything go according to plan. On the day after Matt had the roughest night of his hospital stay, all three of us were in a fairly glum mood when we had a fun surprise — a visit from two hospital clowns whose magic tricks and humorous dialogue had us all laughing in minutes. It was amazing how that unexpected little treat brightened up a day that had been stormy inside and out. I wonder whether a compassionate nurse tipped the clowns off that we could use a bit of cheer. Or maybe they showed up in answer to an indirect summons via somebody’s prayer somewhere. In any case, not knowing they were coming made it all the more delightful. As you go about your days, I hope the thought of unknown possibilities will bring you joy rather than worry. It may take some effort and a little re-programing of our thoughts to think of the coming days and weeks in anticipation rather than anxiety. But we never know what delights might lie in store for us, interspersed among frustrations and sorrows we’re better off not knowing about in advance. Today, I hope you will join me in feeling grateful for the blessing of an unknown future. Grandmother was so happy to see Matt’s great smile even with all the delays before he could go home. Yes, even when things are worst, Matt can usually manage a smile in response to a friendly, loving face. Yes, I thought of that movie when they came in. Jeff and I were surprised how good they were – their tricks and banter were quite sophisticated, actually. And from what the nurses told us, they were quite adept at changing their routine around to target any age from infants to adults. Thank God for such people. It was a wonderful gift to see them that day. Thank you Misifusa! I appreciate your presence here. I fear knowing what lies ahead would cripple risk taking and creativity. Sometimes a lot of our blessings come from noting how God works in mysterious ways in our lives. Bob, that’s so true. Knowing this makes it a bit easier to work on letting go, and trying to fight needless worries. All our fretting accomplishes nothing. Raynard, I’ve found that lots of people have a fear of clowns. I think they have often been portrayed in a sinister way in horror movies. Also characters such as the Joker and the Riddler from Batman. It’s a shame since they can be so funny. I remember how much I used to love watching Red Skelton, or “Red Skeleton” as my little-kid ears heard it. Depending on when and if you pass through VA this weekend, we might be somewhere close to your route; keep me posted if you head our way. Julia, I’ll take this as good advice. I’m sure those two in the hospital setting lift lots of spirits. Yesterday a patient remarked about my happiness and smiling through the circumstances. What’s NOT to smile about? I offered to help him to his vehicle, which he was most appreciative of. It was such a small gesture on my part but seemed to mean so much to him. Of course we both laughed when I remarked that I don’t “charge extra” for the good service. 🙂 Let’s just smile and keep our chins up! Good morning to Jeff and Matt. Oh, no Walter! I wish you could come stay with me for awhile. Or maybe you are looking forward to it? Will you be wearing leather in the next photo I see of you? I really hope that I get to meet y’all sometime! Walter, I hope I get to meet you too! I wish you could come and stay with me while Sheila is gone, but you would need to fly faster than an airplane to do that, so I guess it’s not a possibility. I know you birds are very sociable but try to enjoy the solitude. You can use the time to ponder deep thoughts – like when will they come out with some different flavors of bird popcorn? So good to see Matt’s beautiful smile! What a blessing these two men are to others. We should all find ways to make others happy. Thank you Janice – after the terrible night of pain he had just had, seeing him smile was SO wonderful! Look at his face – what a hearty smile! 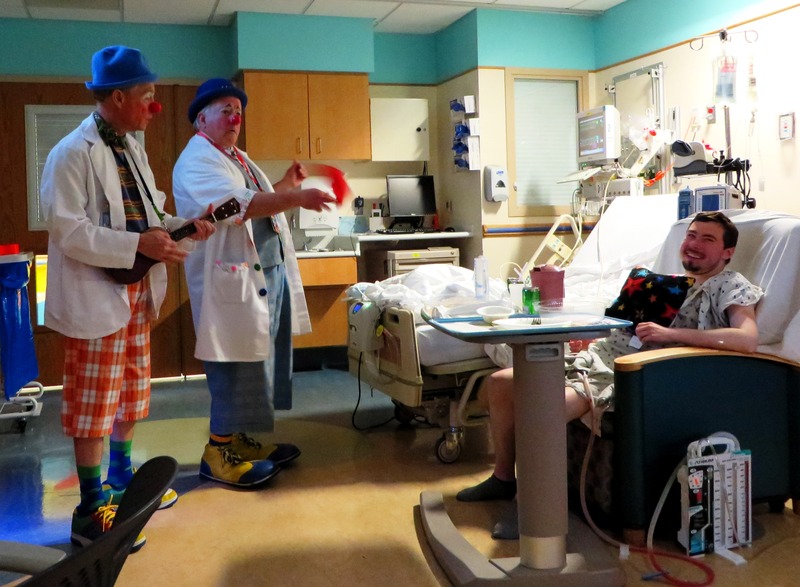 I have never heard of hospital clowns – a great idea. Glad to know they brought some joy to you in that gloomy situation. May God bless those people who do this great service. One who travels on a straight road becomes complacent, because one can see what lies ahead. However, one who travels the winding road can not be certain of what may be around the next bend, and therefore must be ever alert. Complacency leads to listlessness; while being alert to zeal. I know longer worry about the future. I was a worrier for so many years. Then Breast Cancer invaded my space; and, the revelation came “enjoy every moment of every day in every year. Isn’t it interesting how a terrible, awful, hateful thing such as cancer can open our eyes in beneficial ways? Jeff and I have had so many precious moments since his diagnosis, and they never go by unnoticed now. Thanks for being here! I’m happy not to know the future.I think life would be dull, dull, dull if we always knew what was coming. I’m so glad you had your frowns turned upside down by clowns. Who knew such a thing was even out there. I’m so glad you got a photo, and more importantly that Matt is doing better. Thanks Alys! Yes, those clowns were a wonderful surprise. Re: knowing the future and how boring it would be – I think of that movie Groundhog Day, which was hilarious, but had a lot of truth. Oh how I loved that movie! Yes, I usually love Bill Murray in anything, but that is one of the greats for sure. He is such a natural comedian. I don’t watch golf, but I like seeing him in clips, as he is also funny on the greens. Yes, I can take one look at his face and just crack up. His expressions are priceless. Steve Martin and Eddie Murphy are the same way. And long ago, Jack Benny, Bob Hope and Jackie Gleason had hilarious expressions also. Johnny Carson used to be funny when he would start laughing at his own skits – his laughter was so contagious. I love comedians. Yes, to everyone on your list. I’ll add Carol Burnett and Lucille Ball. I think Adam and Eve were exiled from the garden for a sin comparable to wanting to know the future. And the funny (odd) thing: the source of most of my anxiety comes from fearing the worst about what lies ahead. It’s an awful part of me, the part that sees the future, knows it’s bad and spends emotional energy worrying about something that will probably never happen. I deal with a crisis in the here and now just fine, but I haven’t been granted resources by a loving God to deal with stuff I make up. Thank God for that. Jack, I’ve been trying to “cure” myself of that particular affliction for a long time now (and I even worry about what worrying might do to me) 😀 One great thing about getting older is that there is LESS to worry about now in most ways, though. Some of it is already past the point of worry, and some no longer seems important – and I thank God for that! As you say, our imaginations can be a double edged sword. I try to make up mostly fun stuff. Dr. Beano and Dr. Last N. Class sure did brighten my day!!! Matt looks so good and as usual so happy! I am so thankful for people who bring cheer into the lives of others…especially under such circumstances. Thank you Carla! You would have loved them. I’ll have to tell you about some of their funnies. I have been meaning to call you; I may try tonight. Love you. You’re welcome, Mary Ann – these guys were your kind of people! If you had been there you might have popped on a red nose and giant shoes and gone with them! I’m so happy you like the post. Matt had a good day today. Amy, I know this is an exciting and emotionally fraught time for you. It’s hard to believe Aaron is already an adult, but our kids grow up quickly. At least Maryland is not too far, and close to his grandparents. If your home seems too empty and silent, you are welcome here anytime — and between you, Wrecker, the tea and the ice cream parlor (not to mention the movie screening room) 😀 I’ll be easy to talk into a short drive to see you. hehe, Dr Last N Class….that’s cute. Honestly, I’m scared of clowns more than vampires at Halloween but these two look positively cheery. Matt certainly thought so and how heart warming for you to see his bright smile at a tough time. Such a good trouper, your Matt. Will you be bringing him home soon? He must be eager to get out of there too. Boomdee, I’m happy to say that Matt came home a week ago – and is getting better every day. We still can’t get him out much because he still has fluid on his lungs and they don’t want to risk a respiratory infection. But it’s SO, SO, SO much easier to be here than in the hospital! Two weeks was more than enough, though much less than the total of 6 weeks Jeff has spent there in the past year! Yes, we are just to inclined to take stuff for granted if we knew the future. As it is, I still take far too much for granted. Something as simple as a power outage or sore thumb helps me remember to count my blessings. 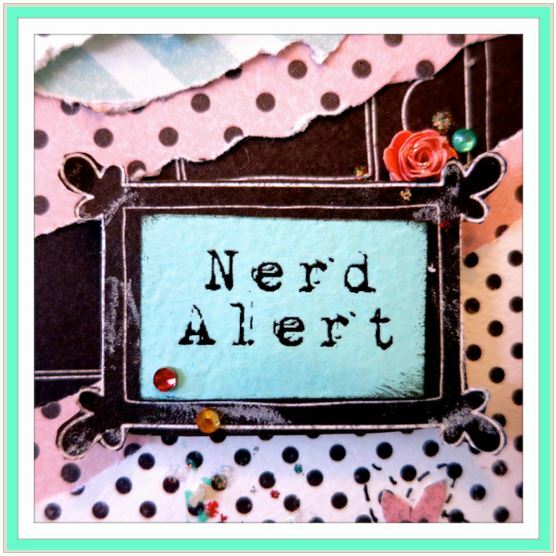 I think I’ll get a copy of Groundhog Day at the library and watch it again soon!